As you make your way over the Canadian Rockies’ Sentinel Pass, you’ll realize the hardest part of hiking in the Canadian Rockies is watching where you’re going. It’s nearly impossible to take your eyes off your surroundings when exploring Alberta — the towering peaks, glistening glaciers, alpine lakes, boreal forests, and big, blue sky are straight out of National Geographic, and you won’t want to miss a thing. On our Alberta adventure tours, you will spend your days trekking over some of the most beautiful countrysides on the planet, where you and your fellow Austin Adventures travelers are the only living souls in sight (except for the occasional flock of bighorn sheep). A couple of truly unique experiences include hiking on Athabasca Glacier alongside one of Canada’s leading expert mountaineers and tackling the Class III and IV whitewater rapids of Kicking Horse River. After all that adrenaline pumping fun, we promise plenty of relaxation, too. Delicious food and luxurious accommodations await, perfect for unwinding over good conversation, a soak, or perhaps reading a book by a warm fire. Also, we promise not to let you leave before you check out the internationally acclaimed shops and galleries of Banff. Alberta enjoys four distinct seasons from snowy winters to mild summers. With the highest number of sunny days in all of Canada – more than 2,300 hours of sunshine each year, Alberta is the perfect place to explore. Alberta adventure vacations can be taken no matter the time of year! You’ll find that the beginning of spring (March and early April) are still quite snowy and the temperatures will stay on the cooler side (10-25°F). This is the perfect time to take advantage of “spring skiing” and other snow sports, when the weather is warmer than mid-winter but the snow is still powdery and fresh. Late April and early May will warm up day by day until you see late spring temperatures in the 60°F+ range. You’ll still need that jacket for cool evenings. Alberta in the fall is a real treat as the tourist season winds down, the aspens turn a dazzling shade of gold and sunshine-filled days continue to hold throughout October. This is the perfect time to hike in the high-country as most of the snow has melted with constant exposure to summer sunshine and the winter storms haven’t hit yet. Expect highs in the upper 40 to 60°F range. Albertans spend half of their year in the snow, so they’ve found lots of ways to enjoy the cold winter! Spending a wintry vacation in Alberta means you’ll likely be downhill or cross-country skiing, sledding, ice skating, snowshoeing, snowmobiling or engaging in the ultimate snowball fight. While temperatures will be chilly (below 0 to 20°F), you can wage a war on the cold by throwing on the layers when playing outside during the day. Wondering How to Prepare and What to Pack on your Alberta Vacation? Alright, so you’ve booked your Alberta Adventure tour; now what’s the next step? It’s time to hop on that treadmill (or better yet, an actual trail!) and study that packing list, and below are a few tips to get you started! 2. Pack Your Layers – and Your Raincoat! You’re headed to the Rockies and that means the weather can be unpredictable. You’ll want to check out weather.com before you pack so you know what to prepare for. One thing we can tell you to pack in your suitcase is layers of clothing. Often it will be cool in the morning and will warm up to shorts and T-shirt weather later in the day. So, you’ll want to have your lighter under-layers packed, but you’ll also want some light pants and mid-weight pullovers or jackets stowed away as well. Don’t forget to bring a quality raincoat – afternoon thunderstorms are common in the Rockies and we don’t want you to get soaked! If time allows in your schedule, we always recommend to fly into your host city a few days prior to the start of your Austin Adventures trip. If you’re headed to Alberta, you’ll likely fly into Calgary, a dynamic city situated on the banks of the Bow River. There are tons of things to see and do, whether you want to visit a zoo, take the kids to an amusement park, walk around a museum, sip on local beers at a brewery, shop downtown or eat at one of the delicious eateries scattered around the city. It also seems that there is a different festival going on every week and you can find an up-to-date list of events on the VisitCalgary.com website. 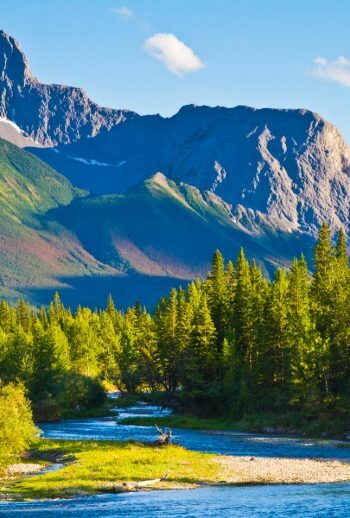 A trip to Alberta should be on every traveler’s bucket list. The snow-capped Canadian Rockies, turquoise blue mountain lakes, and abundant wildlife promise an unforgettable adventure in Alberta’s high country. On your Alberta Adventure, you’ll have the opportunity to spot the “BIG 5” grizzly and black bears, big horn sheep, elk, moose and mountain goats. Keep your eyes peeled whether you’re hiking the trails, cycling the bike paths or even just riding in the Austin Adventures van down the Bow Valley Parkway. You never know what you’ll spot when you keep your head on a swivel. As an American, it’s easy to forget that a trip to our friendly neighbor up north is not an easy skip, hop and a jump over the border. You will definitely need a passport for entry into Canada, but you won’t need a visa coming over from the US. If you reside in a different country, you’ll want to check out the Government of Canada’s website to see if you need to apply for a visitor visa prior to entering Canada. In the Canadian Rockies, you just never know what to expect weather-wise in mountain country. First of all, prepare yourself mentally to enjoy your vacation, regardless of the type of weather! It could be sunny, windy, rainy, or snowy at any time of year (especially in the higher elevations). With a positive attitude, all you need is good gear to enjoy any type of weather. You always want to have a light hat and gloves (even in the height of summer) and lots of layers to pile on or shed off, depending on the conditions.